I have a hard time sorting through papers and getting rid of them. Mail, magazines, paperwork, bills, memories, photos, you name it gets piled up around my house. It gets everywhere. My desk, my kitchen counter, my bed, my nightstand and dresser. Really, it's like sand from the sandbox getting all over my house. It seems like I constantly have a pile to sort through. One fine Sunday morning when I searched for two hours for my primary manual (I'm currently teaching the Valiant 10 age) I decided it was time to fight this clutter if only for my own sanity. I wanted things to have a place for them to actually be there. I've told you before about Power of Moms but I don't know if you've heard of their Mind Organization for Moms program. I have been wanting to take a look at it. After that fateful Sunday I knew it was finally time to take a look. I went to WalMart and stocked up on organizational things. The nice part is they have a shopping list for you! It was invigorating! That afternoon I went around the house and gathered. I had a laundry hamper overflowing with papers to sort. It nearly killed me! Well, I labeled, I sorted and I trashed a whole lot of stuff. Year-old receipts floating around your house anyone? In the end, I finally got that huge pile down to a minimal pile of things to yet sort and question my husband about. I have to confess since then I have been doing a whole lot more organizing. I've tackled the books, the toys, the desk, reorganized a few rooms and generally overall feel a whole lot more together. It's not the easiest thing to start and I confess I sometimes get behind on my papers, but I have had few moments since then of wondering where some vital paper has disappeared to. 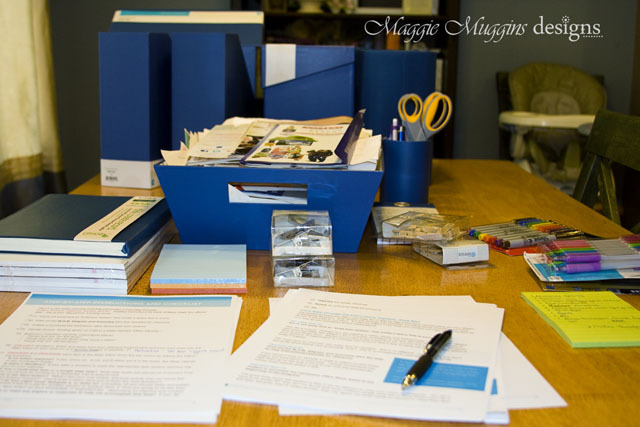 Feeling like you need to get organized? 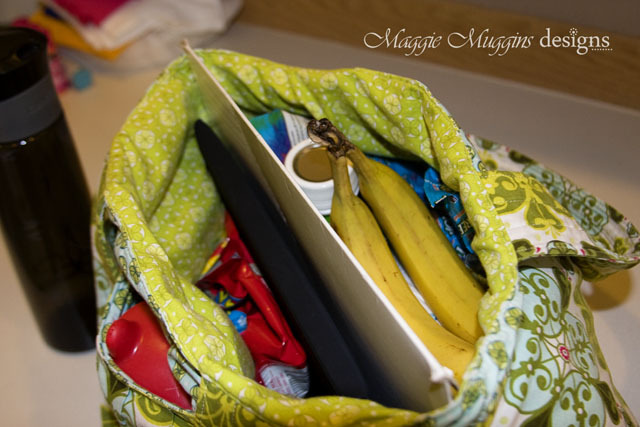 I found a great article on Power of Moms about Organizing to Match Your Style. Seriously, it's worth it to be organized folks. I have way more time for other things! Some of our dear friends are moving (temporarily) to Australia! We had a dinner to say goodbye and planned to give a little travel bag to them for their daughter. 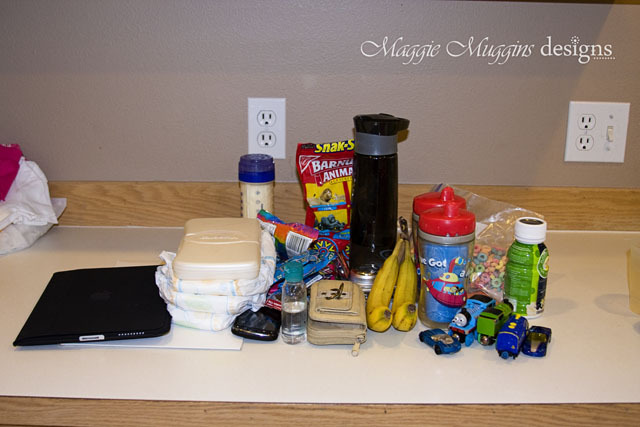 An Airplane Survival Kit for their 16+ hour flight! As we discussed what to throw in (Color Wonder Markers, Dry Erase Crayons, little toys, and some lollipops and snacks) I realized I should make a little travel bag for their daughter. 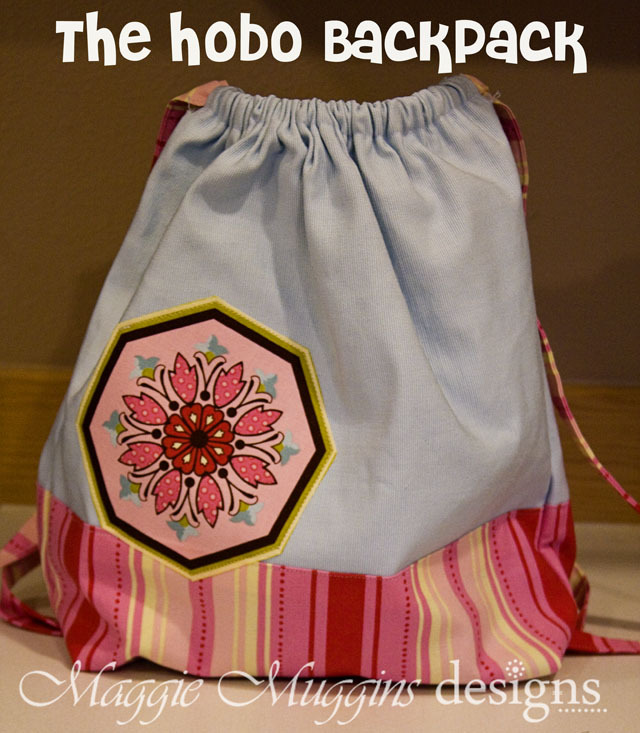 I really liked the idea of a hobo bag. Easy and cute, but I wanted her to be able to actually carry the bag without too much difficulty. 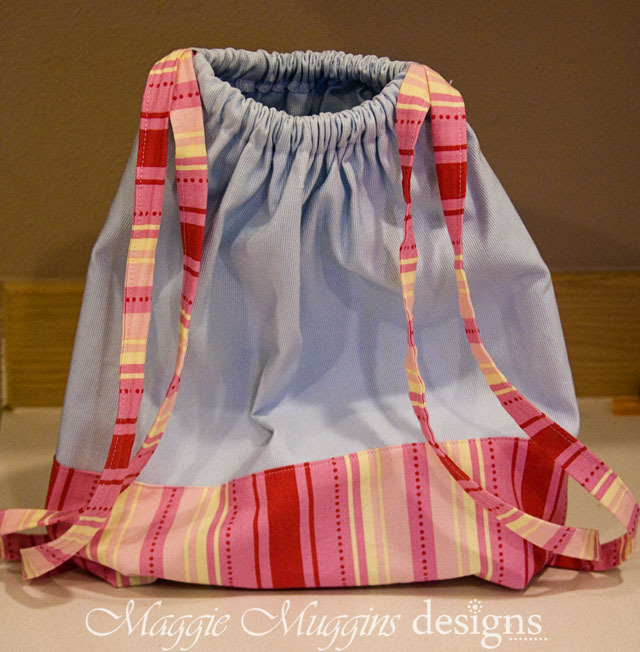 I found a tutorial for a Drawstring Knapsack. Guess what? I was going to link to it for you and I CAN'T FIND the same tutorial, or anything similar. If you know of one, please link in the comments. 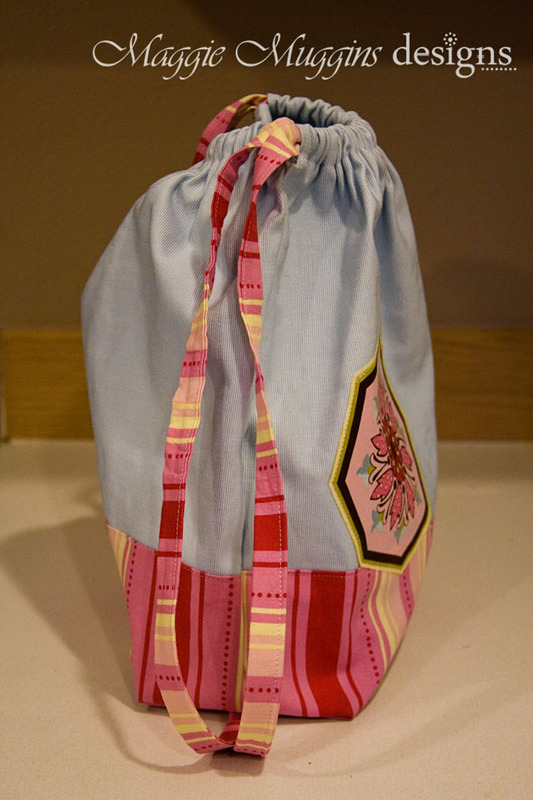 Sandi Henderson's fabric is just so beautiful, wouldn't you agree? Anyhow, I used some blue IKEA fabric (a cushion cover to be exact) that was nice and durable that somehow coordinated perfectly with the other fabrics. 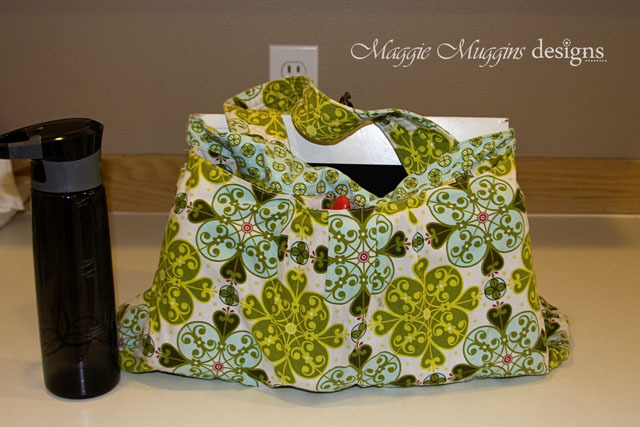 The Straps are just made from a full width cut of the fabric ironed and stitched as Bias Tape. 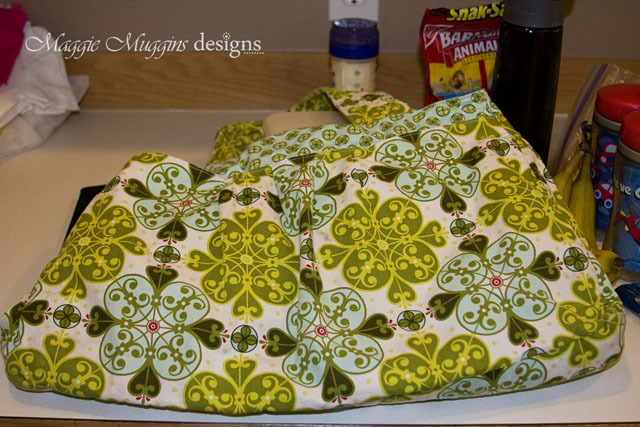 On the bottom I did miter corners (common on a tote bag). This was to help stabilize the bag when it's sitting. For the detail I just added the striped fabric to about 1/4 of the length on the bottom. 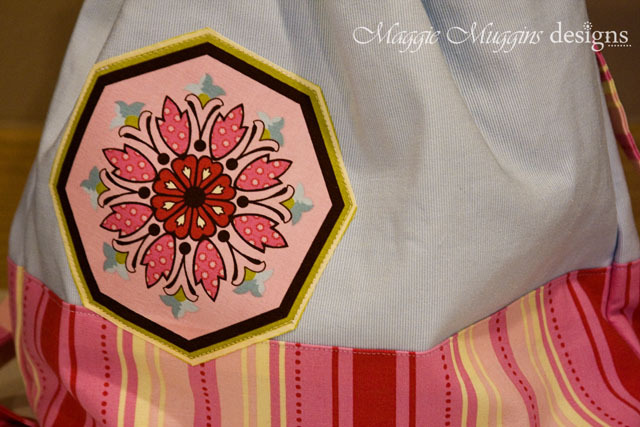 I used Wonder Under to adhere an octagon from the other fabric then stitched around it. 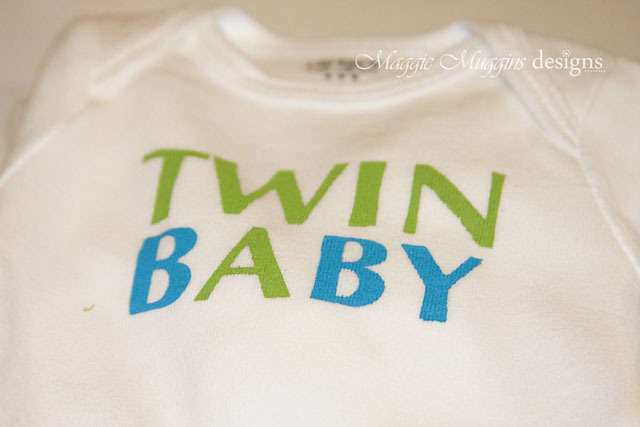 A dear sister in my ward had twin boys recently. I can't imagine what having twins would be like. I always tell my husband that if I were to get pregnant with twins he would be sleeping on the couch for a long time. You see - his Great Grandmother had twins. A boy and a girl. They weighed 11 and 12 pounds at birth! So twins scare me. Just a little. Thankfully there are none on my side of the family. 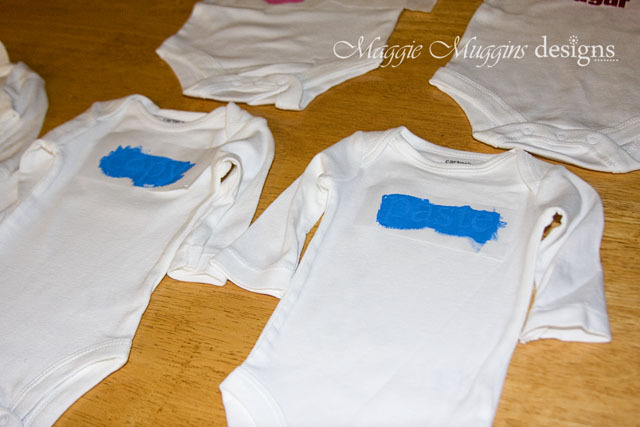 As a little gift for these tiny new boys I made a newborn onesies. You can never have too many of those. 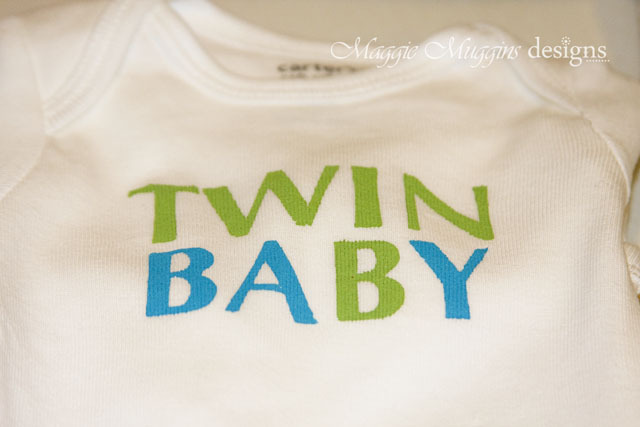 Of course, because they were twins, I had to come up with clever matching ones. These are ideas I found in Google Image Search. I used the Silhouette to cut the freezer paper to do freezer paper stenciling. I could have waited for Heat Transfer Vinyl to arrive - but I already had good colors in fabric paint, so why wait right? 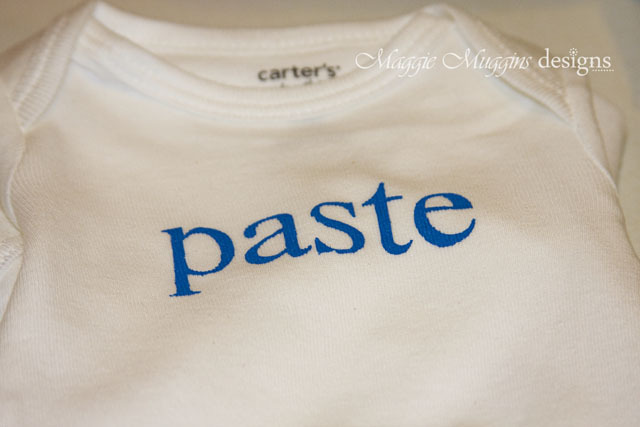 Have you done Freezer Paper Stencilling yet? It's so easy! Once cut, you iron the freezer paper on. Just don't forget to put the little center pieces in for letters. Then you paint, allow to dry and peel the paper off. (I always put some more freezer paper on the back of what I'm doing so if the paint leaks through it does no damage.) Once it's dry I iron it to set the paint. This is the second set. It's my favorite. Cute right? Did you catch that though? It took me a while to get it when I found this idea online so don't feel bad. Hint: Read only the green. I loved them. But no, don't worry it doesn't make me want twins. Just because I know several of my readers are Silhouette Fans - You can go HERE to download my Silhouette file for FREE! 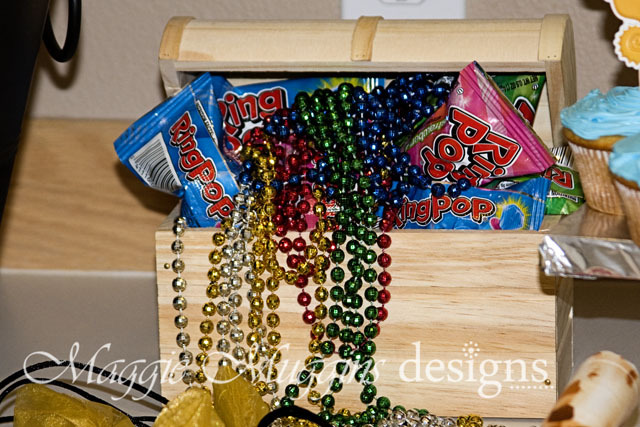 Sharing this post on Blue Cricket Design's Show and Tell Party. You have probably seen it before. The infomercials where they pull everything out of a bag and it just keeps coming and coming. Not going to happen here, don't worry. It's just that as I prepared for my first solo flight I couldn't resist grabbing a photo of all of the junk I was stuffing into my bag. The funny thing is this was not the first time it's held more than I ever expected it to. Like for example, the time I stuffed it with two bags of Costco Rolls (yes two)! Or, when we were at Great Wolf Lodge and it hold our clothes and snacks, for our family of four! I tell you it's really not THAT big of a bag, but somehow it's capacity is beyond what I expected. Take this trip for example. I was washing my bag so I didn't just stuff it like I normally do. Instead I set everything for my bag on the counter as I packed. When it was finally time to load it all in I stood back and stared in horror. Don't worry - The water was all gone before security. I've never filled my bag this way remember? So I began to truly wonder if everything would fit. And really, don't worry about my back. This was hanging on my stroller not my shoulder as I walked chased my son through the airport. Today I failed at Father's Day. I tossed and turned all night, slept in until almost 9 without even knowing it, and then woke up with a bolt! It was Father's Day! Of course, the kids were up, he had already fed them breakfast, done some laundry, finished the dishes, and been sung to "Happy Father's Day to You!" by our oldest. I truly felt like a failure. It was the day I was supposed to dote on him. In a groggy stupor I got his gifts, forgetting the price tags all over them, and we had a gift opening. It was fun to watch the boys excitement as they celebrated their Father. Of course, I hadn't gone shopping last night out of sheer exhaustion (it's full-blown allergy season folks and my medicine is not working!) either and dinner was a last minute - thrown together in the crock-pot meal. I tell you, if I could have such success with a meal I'd cook like this daily. It was a fantastic meal. I have to share my latest recipe with you! 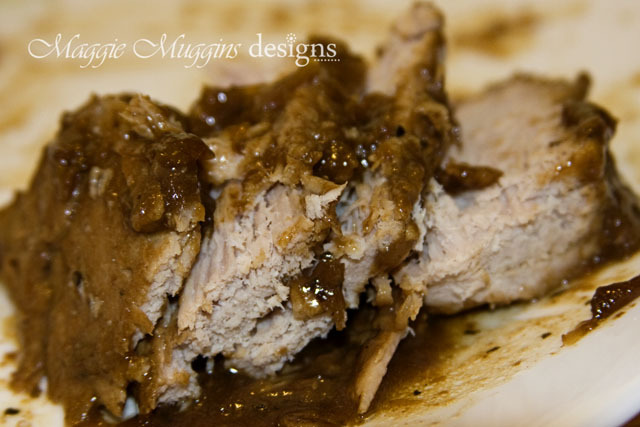 Cut up the Pork Roast into 4-6 light portions. Broil the pieces in the oven for 2-3 minutes on either side. Mix the rest of the ingredients and combine with the Pork in a Crock Pot. Cook on High for 3-4 hours or Low for 7-8 hours. This was absolutely divine. I loved it so much and the sauce was perfect as a gravy. Delicious. I served this with rolls, steamed carrots, and mashed potatoes. We just got home from a week long trip. My husband was needed to help with his Grandma and we decided I should go with the boys too. That meant I had to fly by myself with the boys for the first time. I knew I could do it, and we prepared every way we possibly could. I'll be back with more fun crafts and things, but for now, some flight survival tips. Luckily my husband was going the same place as us, just one day in advance. So in order to lighten my load, we packed our clothes and he took the suitcase so I wouldn't have to bring that into the airport myself! I had one small bag with toys, blankets and other necessities he couldn't bring, my diaper bag and the kids. I checked the one bag and headed on my way to security. You might have read that and wondered - but what about car seats?! Some rental car companies rent them with the car, but we had no need to rent a car. So we used a company I heard about just after having our first son. Baby's Away rents all sorts of Baby Products (including Car Seats) to people and has several locations in 25 States. It was $80 total for two car seats for the 6 days we were there. Not bad considering what they would have cost us to purchase. Now, this may not be something you need every trip, or want to do. But this time around, it saved me from hauling one more thing into the airport. I had a wonderful friend drop me off at the airport instead of having to park. That saved me a ton of walking and time! I've seen a lot of Mom's flying solo and often wondered how they did it. This time I paid attention more. A LOT of them still had someone with them until check-in was complete. Friends are wonderful! Because I knew the rules of security, I was able to make that easy on myself. I had no metal on me, slip on shoes, and the kids were the same. No liquids were with us except the bottle, and it was actually a relatively fast and painless few moments. The most difficult was getting the umbrella stroller folded while holding a toddler, and one of the employees actually took over for me. I was so upset when I could not find my Toddler Leash the day of our flight. I still have no clue where it is. I planned to use that to let the little one run around (he's lightning fast and goes everywhere) before our flight. Instead he held my hand I held his hand as we walked around. The older one just wanted to sit and watch everything, but instead got pushed around in the Umbrella Stroller . I brought: Fruit Snacks, Animal Cookies, Orange Tic-Tacs (a new favorite of my son's) and Bananas. I was worried Bananas wouldn't be allowed through security, but they were. I also got water as soon as we cleared check-in and M&M's (persistence sometimes wins). I refused all snacks on the airplane and did really well. It was easier and I didn't get sick after like I usually do. No more airplane snacks for me. I LOVE the iPad ! My older son played a train game the entire way that I had just purchased. It was amazing. The younger one played with a few Apps on my phone (KidsPaint), but was more entertained by the air jets overhead. We sang, we tickled, and we had a genuinely decent flight (albeit - exhausting) up until the dreaded decent. The bottle was gone and they both refused their sippy cups. I was at a loss as to help their poor ears. (My oldest kept shouting "HELLO" because he was trying to see if he could hear better.) Coaching him on Yawning had little effect until suddenly he began the "Yawn Song" which was, I believe "Twinkle, Twinkle Little Star" but sung using only "Ya". It was so funny. On the way home I decided to try gum. Epic Failure. My son didn't like the flavor, so that was the end. The youngest refused the bottle, the sippy cups were once again pushed away and I was starting to get worried. Luckily, while purchasing the gum in the airport I noticed the over-priced lollipops next to the checkout. I purchased 4 of them - as a just in case. 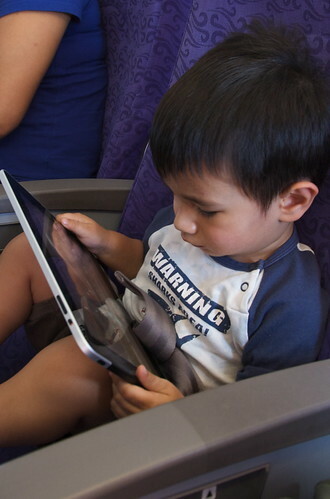 There was no screaming or complaining from either one of them until the last 2 minutes of the flight when suddenly my oldest son finished his lollipop and protesting the "funny feeling" in his ears. I'm not sure if it was the sucking that helped or the distraction. But they worked like a charm! When you've finally made it off the plane, almost home and the water bottle that you shoved into your bag, thinking it had a lid on it, starts pouring down onto the floor, grab the bottle, chuck it out, pull out all electronic devices, wring out your bag (if possible) and chuckle the whole way down to the baggage claim. Because trust me - it can always be worse! 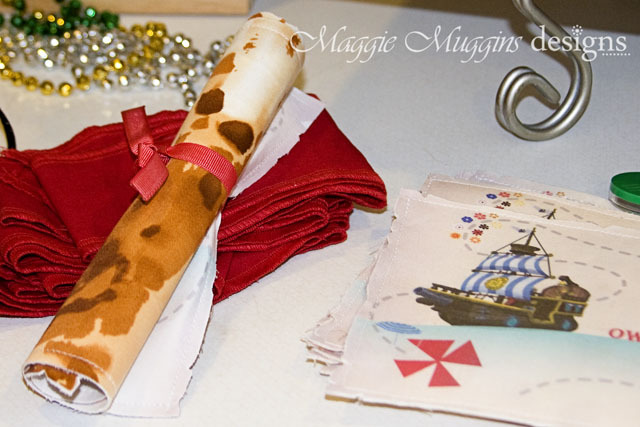 Did you see this stack of red bandannas underneath the treasure map in my recent post? My son wanted to dress like Jake for his party. Jake has a red headband. (It's a rolled bandanna look.) so I grabbed some red fabric from my closet, whipped up a pattern quickly. I cut out two pieces of fabric, thinking I would sew them together, then flip it right side out and top stitch. Then I remembered I had red thread for my Serger AND that I had figured out how to do a tighter overlock stitch. So I made two headbands instead of one. It was so fast and easy that I decided to make 6 more for the rest of the kids! 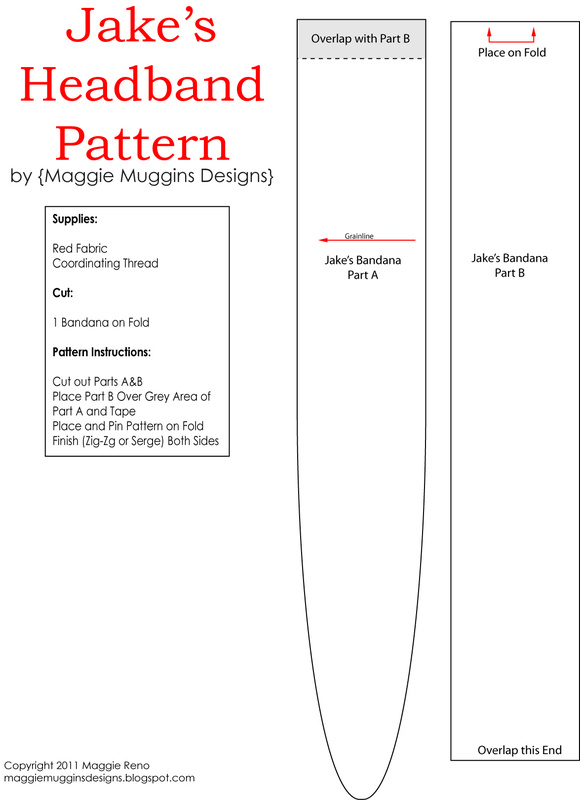 And just because I can't not share, I decided to share the pattern with you - for FREE! You can download the pattern HERE or click on the image below. 1. Print the pattern with the printer set to "Borderless". Cut out Part A and B. 2. Overlap Part B with Shaded Area of Part A and tape or glue. 3. 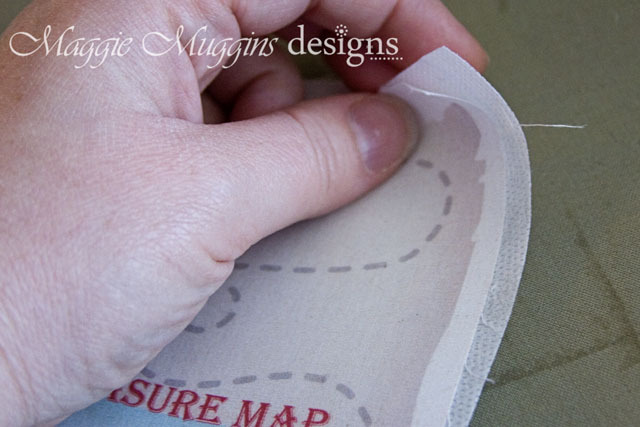 Place the Pattern on the fold of fabric where marked, pin and cut. If you follow the Grainline arrow direction the band will have more give lengthwise (in other words the fabric will stretch the length of the band, but not the width). 4. Serge the entire length of both sides of the Headband. For a tighter satin look reduce the stitch length to your smallest setting. 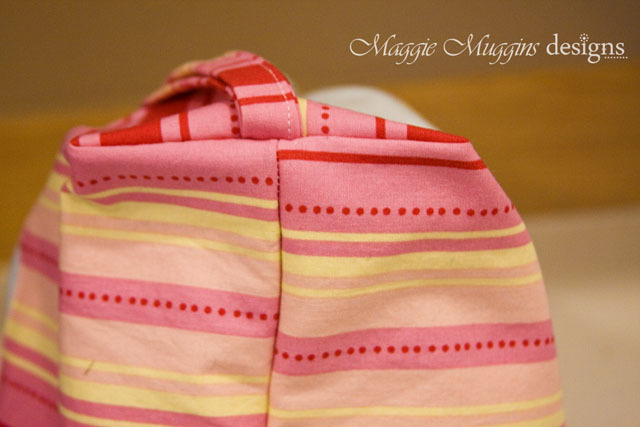 *If you don't have a Serger, use a tight zig-zag stitch on your machine, or straight stitch at 1/8" from edge to prevent too much fraying. You can adjust the length of the headband just by adjusting the overlap. The given length will fit up to an adult. I liked that everyone in our house could wear it! The best part of this pattern is you can try it on before sewing and adjust it without having to cut out a new one. Just fold it in the center again, lay the adjust pattern on top, place on the fold where marked again then pin and trim the end! 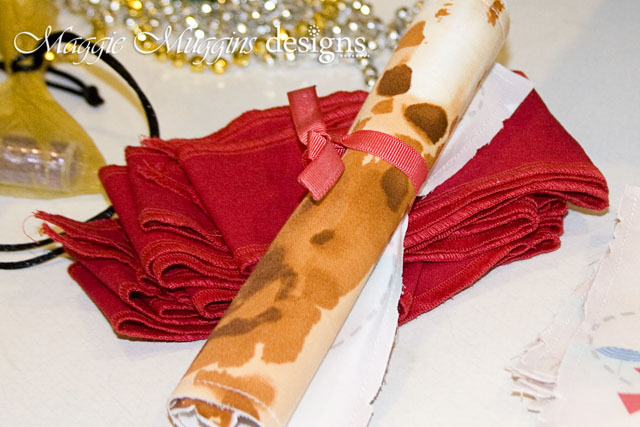 This can also be used for a Blindfold, a Headband for Girls, Arm Bands for Fun Games, and so much more! 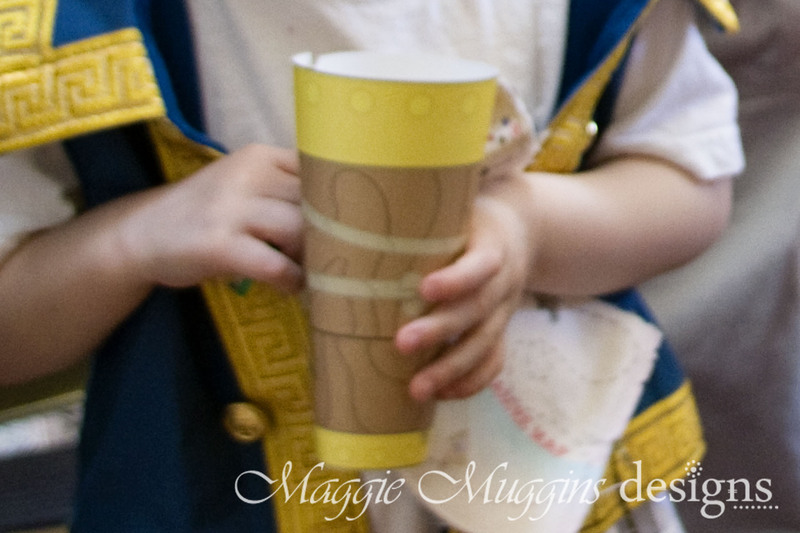 Linking up to Blue Cricket Design's Show and Tell Party. I was so excited as I walked through Joanns a few weeks before my sons birthday and saw a bunch of their Wilton Cake pans marked down to $2.99 (from $12.99). At that price I had to look and see what they had. Imagine how thrilled I was to discover a Pirate Ship Pan ! It was so meant to be. Unfortunately, it was out of stock. So three stores later I scooped up their last one and ran to the cashier. 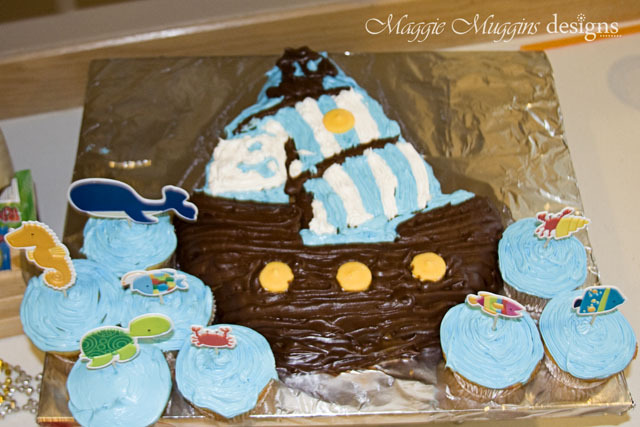 Now, I am not accomplished in the magical art of cake decorating. I have only used fondant once, and I had no desire to go overboard here. I just did the best I could, and prayed my son would think it looked like "Bucky" from Jake and the Never Land Pirates. And then, I took the lamest photo ever in a rush effort. I would highly recommend practicing cooking with a Wilton Cake pan prior to actually making the birthday cake. I had a panic attack a few hours before the party when I couldn't get the cake out of the pan for the life of me. I followed all the instructions, but it was holding in there tight. I tried loosening the edges, I tried whacking the bottom a bit. In the end I actually had to dig my fingers in on the sides, and pull on it to loosen it. It came out with one small piece left in the pan. I confess I was amazed. If you want to go all out - this is another idea you can do using this same cake pan. 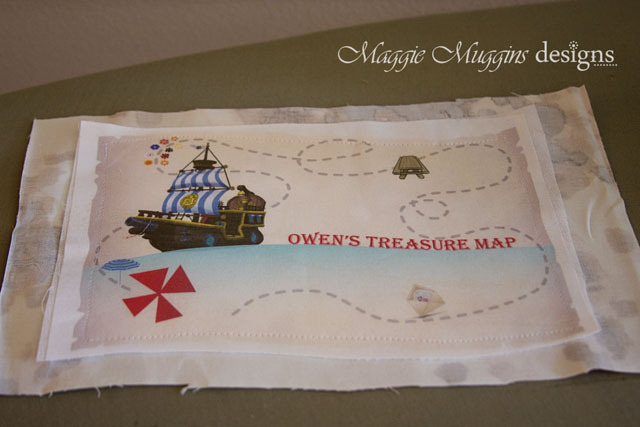 Did you see the Treasure Maps in my last post? They're not only adorable but I made them out of fabric!!! You might be thinking - that just seems like too much work for a kids party. If you could see the way it's been played with since the birthday, and the lack of damage to it (no bends, no rips, no plastic pulling back, and still no need to wash it) then you would understand the reason I made it so sturdy. In other words: No Tears, No Drama, No printing 5 more in one week! Honestly, I wasn't planning on making them all fabric, but after making the first one, for my son I decided to do the rest the same way. And because it was so easy I've made a tutorial for you. 1. Get your Map image. 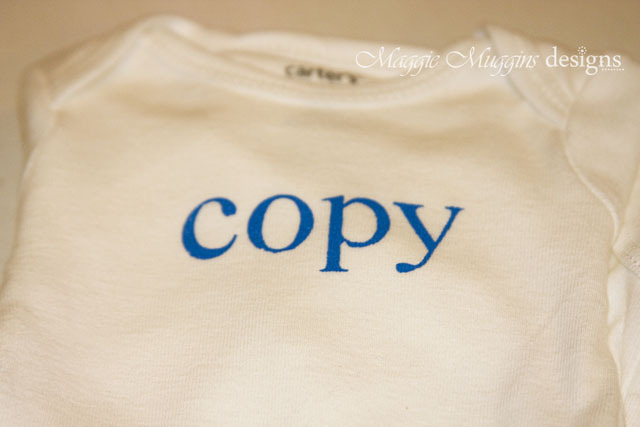 You can either make on yourself, search for one, or I can personalize the one I made for you. Email me about the cost. I created the map for his birthday and made each one individual with their name. I put images all around the path that related to places they had to find for their hunt. 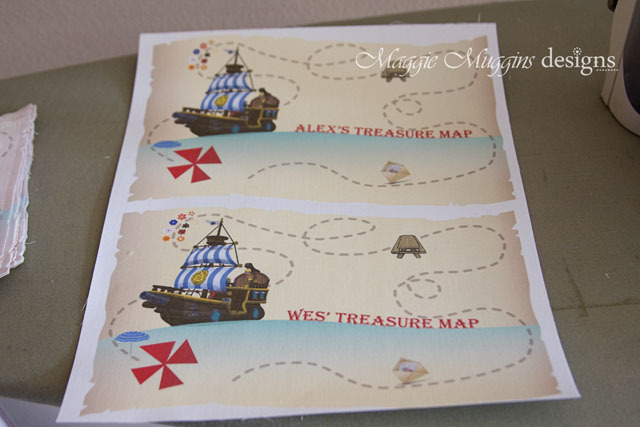 Envelope for Mailbox, Picnic Table, a Flower Path, and the Umbrella over the Water Table out back ending in finding the Treasure right by the Water Table. It was simple photos because of their age, and it worked great! 2. Test print the Map on regular paper first. That way I knew the colors looked good, and the size was right. If it doesn't look right, adjust the photo or printer settings and try again. You can also play around with the Map size and quantity. My son preferred the smaller (about 5x7). It's perfect because that means you can print two maps to one page. I used my HP Photo printer. 3. 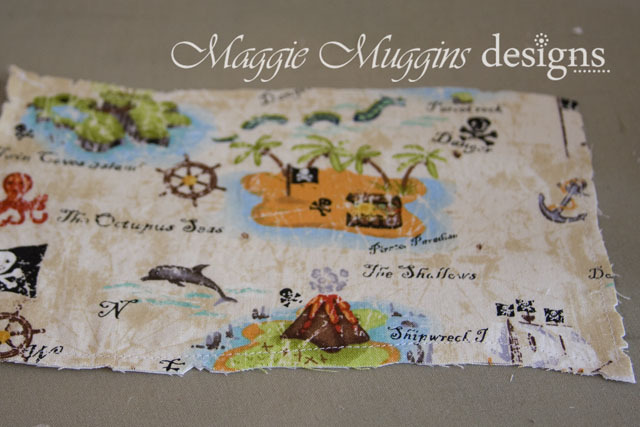 Print the Map onto the fabric page. Printer color can be set to "normal" and paper to "plain paper". 4. 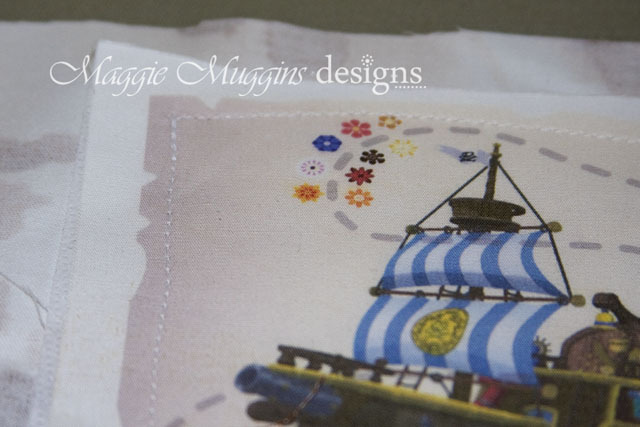 Follow the instructions for setting the color to the fabric. I had to wash the fabric in cool water for about 30 seconds to make sure the ink wouldn't run anymore. 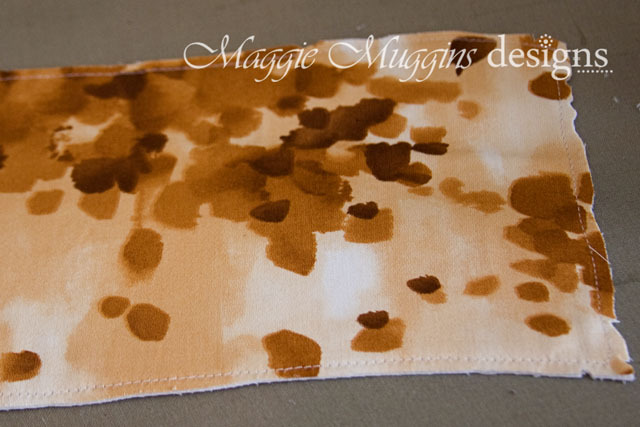 Then I blotted the fabric to get some water out and ironed it dry with a dry iron. 5. Cut our each individual Map. *This does not mean perfectly cut out the detail, instead just cut on the white fabric so they are all separate. 6. Cut interfacing to size of Map. 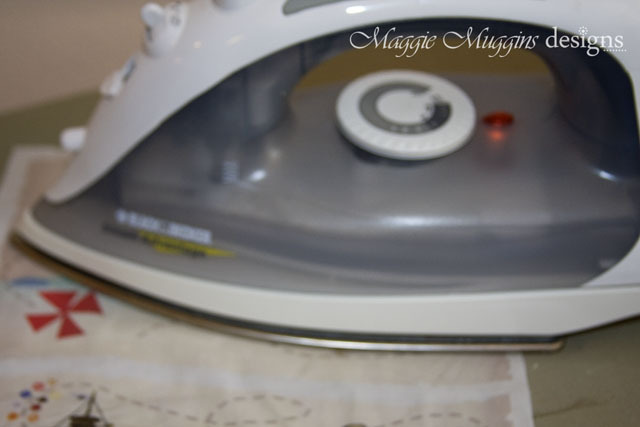 Iron the interfacing to the back (wrong side) of the Map. This is personal preference. I highly recommend a good interfacing, but you could use lightweight, or iron it on to the backing fabric instead of the map. Just depends on what you want. 7. Wrong sides together, match up the Map and backing. (*Optional: Fold the Ribbon in half and pin in between the Map and the backing.) Sew 1/4" border around the edge of the Map. 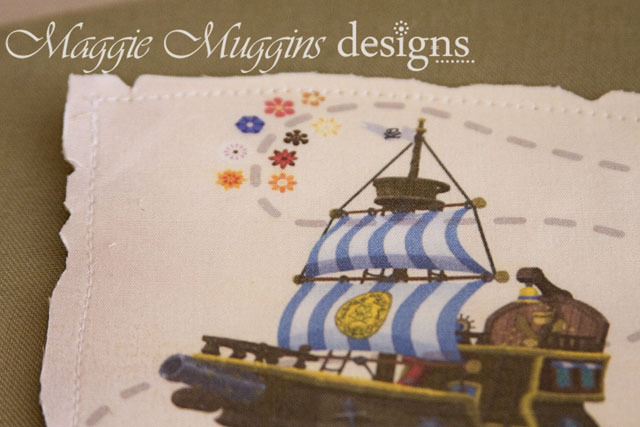 The backing fabric I used was fabric I ordered when I was pregnant with my first son. It wasn't at all what I expected (it's actually weird fish on it) but I was too lazy to return it. When I was about to make the maps I realized how perfect it would be - it sort of has an aged parchment look. 8. Trim the edge of the Map following the image as closely as possible. If you attached the ribbon, make sure not to cut it as you cut everything else. This image had a lot of indents around the edge of the map to make it seem more aged. It looked really good clipped out of the fabric too. You're done. Stand back and admire your handi-work! Roll it up and tie it with the ribbon. The kids are going to love these! 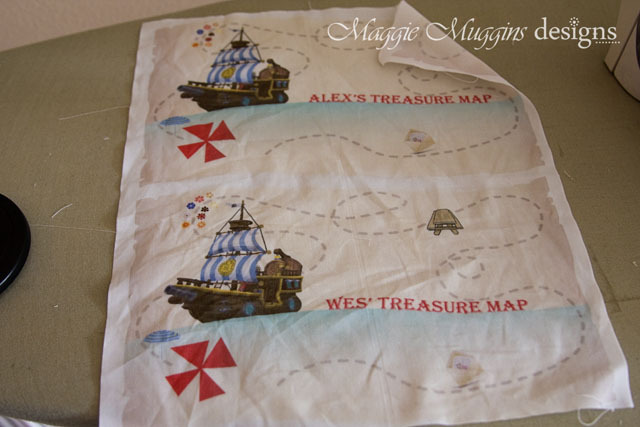 I had some special pirate fabric I ordered from BugFabric.com! They have quite a few options, but I loved the Andover Pirate Line. It's great colors and tones and not as dark as some of the others. 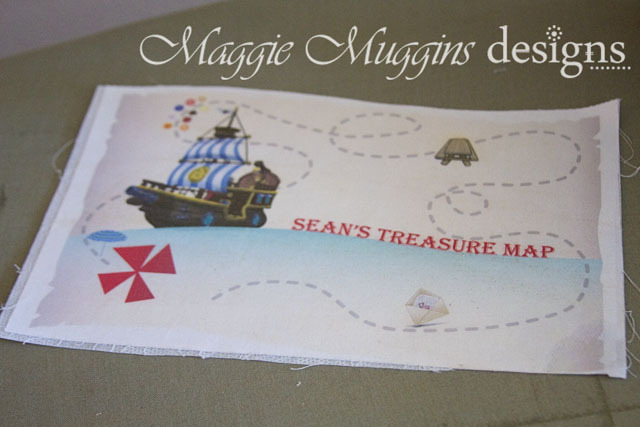 I plan to make a pirate banner for my son's bed, but used a little bit of the fabric to back one of the maps. It's so cute! Here are all the maps made from one Package of Printable Fabric that I purchased for $12. Everything else I used I already but considering everything the maps probably cost $1.30 each to make. By the way - have you seen sneak peaks in the last few posts? 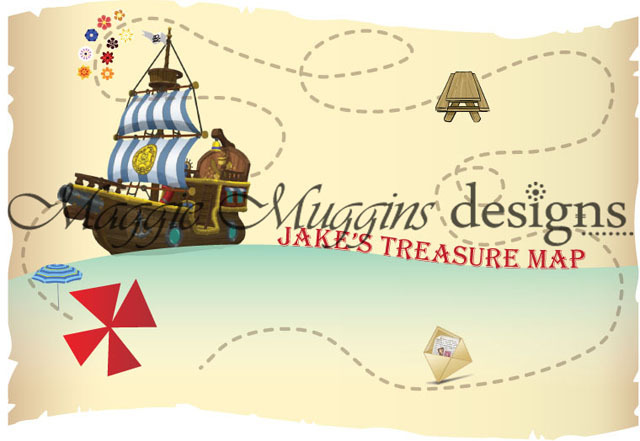 There are more Jake and the Never Land Pirates Party things to come! 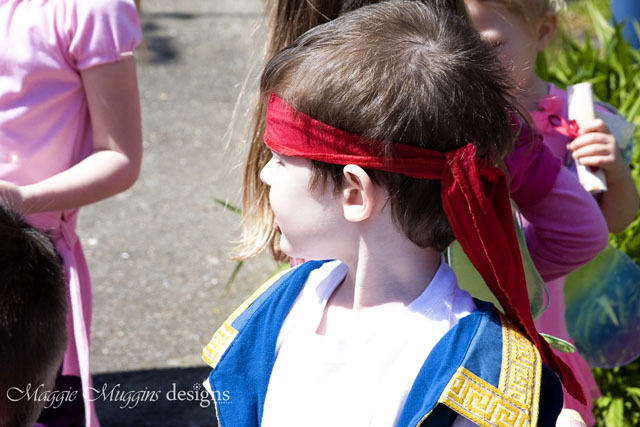 The party began with our little Pirates and Pixies arriving. I as so pleased to see the kids had dressed up for the party! My son was even more excited as his Buccaneer friends arrived. Thanks to my amazing husband we had several fun activities planned. 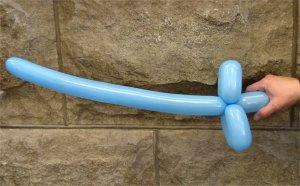 While I did last minute food preparations my husband whipped up several balloon swords! (He learned how to do them just for this party - isn't he awesome!) The best part was somehow, despite being the largest person in the room, the kids felt safest attacking him with the swords. It was quite entertaining to watch him attempt to create a balloon sword while being attacked by 4 or 5 of them at the same time! Anyhow the kids had a great time sword fighting while waiting for their lunch. You can find instructions all over for Balloon Swords, but this site has simple directions. After eating the kids played for a while so that I could clean up and get things ready for their next activity. Then we made their telescopes! These are super easy to make and you can download the free printable from disney.go.com - there's a whole activity book! Once they had their telescopes ready, we armed the kids with little compasses and their own personalized Treasure Maps. I said a few lines of silly rhyming treasure hunting clues and then they set out on their treasure hunt. 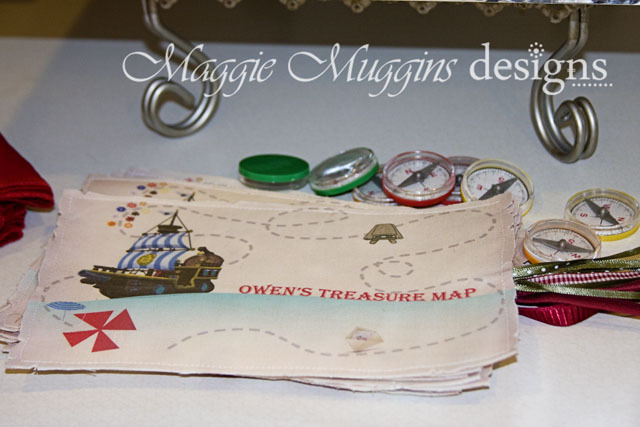 Their treasure hunt involved finding places on their maps and once they found them "Gold Doubloons" appeared as if by magic (my husband had a bunch stashed in his pocket and would toss a few at each spot). Finally, they discovered the treasure and brought it home to divide the loot! My husband built the treasure chest from a kit he found at Lowes! He also stuffed it to the brim from things he found at the Dollar Store. He rocks! After quickly opening awesome gifts from his dear friends we blew out candles and ate some cake and ice cream! It was so much fun!